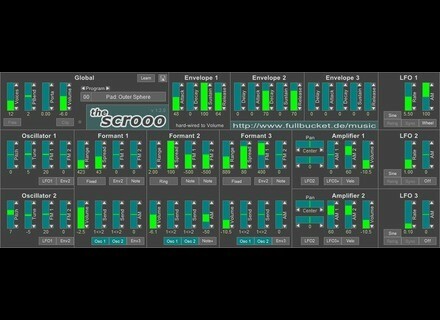 The scrooo, Other Virtual Synth from Full Bucket Music. Full Bucket Music has released The scrooo, a new free VST2.4 polyphonic software synthesizer plug-in for Windows based on a spectral formant synthesis architecture and written in native C++ code for high performance. Three independent formant generator sections. Waves Aphex Vintage Aural Exciter WavesAudio, in association with Aphex, has announced the release of their modeled plug-in version of the original Aphex Aural Exciter. Twisted Tools Scapes for Reaktor Twisted Tools has released a new Reaktor ensemble effects processor and sound generator based on feedback, called Scapes. Noisebud Bompa 2 Noisebud has announced that it has updated Noisebud Filter to version 3.11 and released version 2.0 of Noisebud Bompa.